Bike around the city or enjoy a relaxing ride through the scenic winding logging roads leading up Breitenbush River. Take in striking views off of one of the many scenic points you’ll encounter. The Cascading Rivers Bikeway follows the woven Clackamas and Breitenbush Rivers in a 72 mile link from Estacada to Detroit. Water is the dominant force that sculpts the volcanic landscape of the West Cascades. All along this route, water and rock interact to create a place of dramatic beauty and inspiration. Rivers, rapids, waterfalls, hot springs and lakes captivate and guide the rider. Time is forgotten as a pausing rider looks up to the sky through ancient forests that line the bikeway. Where there is water, there is life. Riders may experience glimpses of elk or a fluttering grouse or rest along the route to a symphony of forest songbirds. The bikeway parallels the nationally designated Wild and Scenic Clackamas River along rocky rifles, quiet pools and reservoirs. Beneath the waters, native runs of Coho, Chinook and Steelhead seek their ancient spawning beds. Vistas of Mt. Hood and Mt. Jefferson smile down upon the exploring cyclist. Experienced riders who seek a challenge will be most attracted to this 72 mile route of forested splendor paired with a 3,125 foot climb from Estacada and 1,985 foot climb from Detroit. A shorter family-friendly ride is available from Estacada. Those coming from the north or through Portland Airport will be able to utilize the Portland Tri-Met system all the way to Estacada. Free parking is available in both Estacada and Detroit. The US Forest Service offices in both Detroit and Estacada offer campsite information and road condition reports. This route is closed during late fall and winter. Detroit Lake Beach is located in Detroit Lake State Park . Facilities in the park include two swimming areas and picnic areas. Detroit Lake Beach is an unguarded beach – no lifeguard is on duty. Swim at your own risk. Swimming is not allowed outside of the beach area. Actively supervise children in and around open bodies of water, giving them undivided attention. Appoint a designated water watcher, taking turns with other adults. Keep a cell phone nearby in case of an emergency. 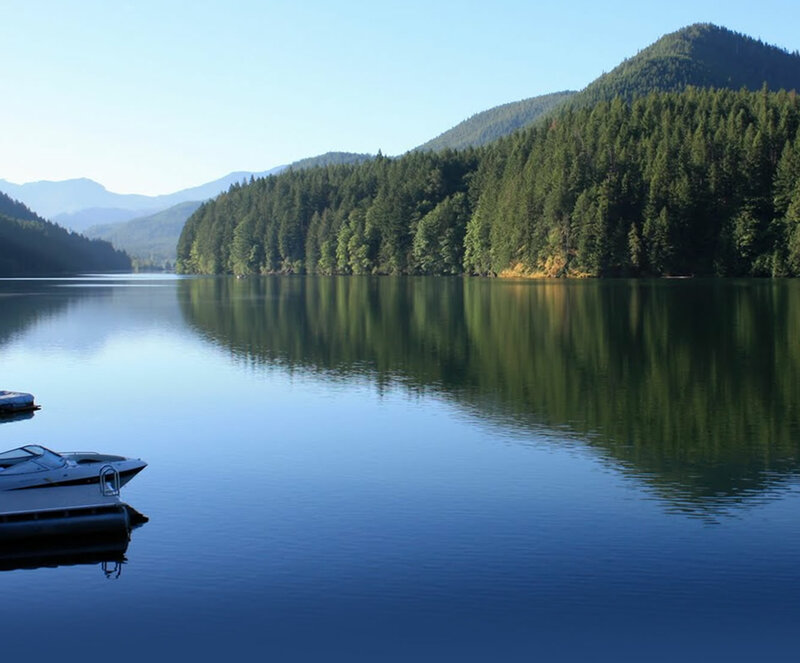 Tie Up Spots: The best tie-up spots include the Breitenbush arm near Detroit Lake Marina and Blowout located at the far southwest end of the lake. These calm coves offer shelter from the wind. Sun lovers enjoy visiting, swimming and relaxing. Water Skiing & Wakeboarding: Get up early or go out late! The lake is calmest at sun up and sun down. Sailing: Head towards Detroit Dam where the wind consistently fills the sails, creating a great experience! Sightseeing: Be sure to go visit the beautiful waterfall at Kinney Creek. It is a scenic lunch spot, but keep your eyes peeled for our family of Bald Eagles who make Detroit their home! Mongold Day Use area is 1.5 miles west of Detroit Lake State Park on Hwy 22. It’s the only public boat launch facility on the lake featuring a swimming area, grass beach, picnic facilities and restrooms. Mongold is a year-round fee area. Mongold has 58 single car parking spaces and three fully-accessible parking spaces near the swimming area, and another 25 single car parking spaces at the top of the parking lot. There are 120 vehicle/trailer parking spaces, and three that are accessible to people with disabilities. Overnight parking at Mongold is permitted only when the visitor is camping on Piety Island. Cove Creek Campground is located approximately 5 miles east of Detroit on Hwy 22 and Forest Road 10. Forest Road 10 is also known as Blowout Road. It has one improved boat ramp. Hoover Campground is located approximately 5 miles east of Detroit on Hwy 22 and Forest Road 10. Forest Road 10 is also known as Blowout Road. There is one improved boat ramp. South Shore Campground is located off Hwy 22 on Forest Road 10 also known as Blowout Road. There is one unimproved boat ramp. Seasonal Marinas/Moorage: Kane’s Marina and Detroit Lake Marina provide seasonal moorage facilities when the reservoir is full. These fine businesses do not have boat ramps at their locations. Please utilize the other boat ramps in the area. Remove the stresses of civilization with a walk through the towns of Estacada and Detroit. Both are full service towns with many options for eating and situated on tranquil waters. Each town is distinctly different but similarly rooted in its historical attachments to water power, mountains and forests. Detroit Lake has hundreds of amazing trails you’ve have just got to experience. Striking views along the winding trails are located throughout this nature wonderland. Ample information about hiking trails in the area are available on various websites and through the forest service. Located in the Cascade Mountains, Detroit Lake State Park is the gateway to beautiful Detroit Lake. The 400-foot-deep lake was created in 1953 when the U.S. Army Corp of Engineers completed the Detroit Dam project. The lake is over nine miles long with more than 32 miles of shore line. This is the spot for all types of water sports: fishing, boating, swimming, water skiing, and personal watercraft. Detroit Lake provides year-round fishing opportunities as long as you fish in still water and not in or near the rivers and streams. Available catches include rainbow trout, fingerling rainbow, kokanee and brown bullhead catfish. Anglers are regularly on the water getting their “fish on”. The Detroit Lake Recreational Area Business Association (DLRABA) hosts an annual 3-day fishing derby event each May. This fabulous event brings in friends, families, serious anglers and first-timers. Prizes abound with many ways to win! If you want to go where the big boats can’t or want a quieter experience, consider kayaking or paddleboarding. Bring your own or rent one from the local shop. Kayaking and paddleboarding allow you to explore tiny coves, get out onto shores, and get some good exercise. Just be sure to get good instructions to ensure your safety and a quality experience. From scenic Detroit, snow skiing is less than an hour away at Hoodoo. Instead of camping at Hoodoo, you can come back to cozy lodging, warm food and hot drinks. In addition to hiking and sledding, snowmobiling is one way to enjoy our area in the winter. Nearby McCoy Creek has groomed snowmobiling trails and a warming hut. The Detroit Chapter of the Oregon State Snowmobile Association (OSSA) contributes to these amenities financially through member dues and volunteer time. If you are interested in this activity, please consider getting in touch with the OSSA.